Recipe 52: We are almost at the end of this holiday and I couldn’t leave without doing a cake. The problem is that here we don’t have the oven and not even the kitchen instruments I have at home. So it was quite difficult to think in a cake recipe, but I also couldn’t resist to use some fresh forest fruits! Here there are some amazing raspberries and blackberries! So what about a cheesecake? Ingredients: 200gr biscuits (I used the “Campagnole” from Mulino Bianco… the best biscuits ever in Italy), 100 gr butter, 400gr Philadelphia (I used half normal and half light), then 60 gr sugar, 1 egg, and 50gr dark chocolate (I used just 30gr for half cake) and/or 50 gr of raspberries ( they are sweeter than blackberries). You can even add some iced sugar on top and marshmallows if you like it. Mash the biscuits until reduce them in powder, and add the butter already melted. Mix it all and place it in a baking pan creating the base of the cake. In another container place the Philadelphia cheese, 40gr sugar and the egg yolk. Mix all well and then add also the white of the egg already whipped up. Fill the base of the cake with the mix and use a knife to make it homogeneous. Now do you prefer to cover it with chocolate or rasberries sauce? For the chocolate put some water to boil in a saucepan and place the dark chocolate in another little saucepan. Place this one in the water and let the chocolate melt slowly ( this system in Italian is called “a bagno maria”). When ready spread the chocolate on the cake and add some iced sugar or marshmellows if you like. If you prefer the raspberry sauce, place some rasperries in a saucepan with some sugar (one spoon and half) and let it melt. You can add some water if you need but I don’t think you will need. When ready, cover the cake with the sauce and you can also add some fresh fruit to make it looks better. Place it in the fridge for at least 2-3 hours and serve it cold! Buon appetito! 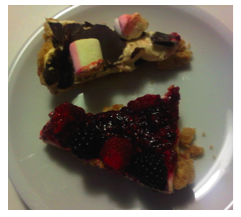 Recipe 86: Today i had a little treat. It’s a long time i wanted to cook this dish and finally i had in the fridge all the necessary…so here are the stuffed courgettes. Of course after Easter i needed to go for something light and this mix of meat and vegetable it’s just the right and balanced thing to cook. Ingredients: you will need 2 big courgettes, 250 gr mince meat, 1 egg, 20/30 gr of Parmesan, 20 gr bread crumbs, nutmeg, parsley, olive oil, salt and pepper. Wash the courgette and cut the beginning and the end. Put them in some boiling water for 5 minutes and then drain them. Cut them in half and take off the center from all of them. Put this in a side and cut it in little pieces. Place in a bowl the mince meat with the pieces of courgettes you just cut, add the Parmesan, some bread crumbs, the egg, salt, pepper, the chopped parsley and some nutmeg. If you like it, you can also add some soft bread soaked in milk or some Pecorino to give more taste. Mix it all and then start to refill the courgettes one by one. In the meantime, prepare a baking pan putting some baking paper or aluminium foil. Here you will need to pour 3 spoons of olive oil and a bit of water. 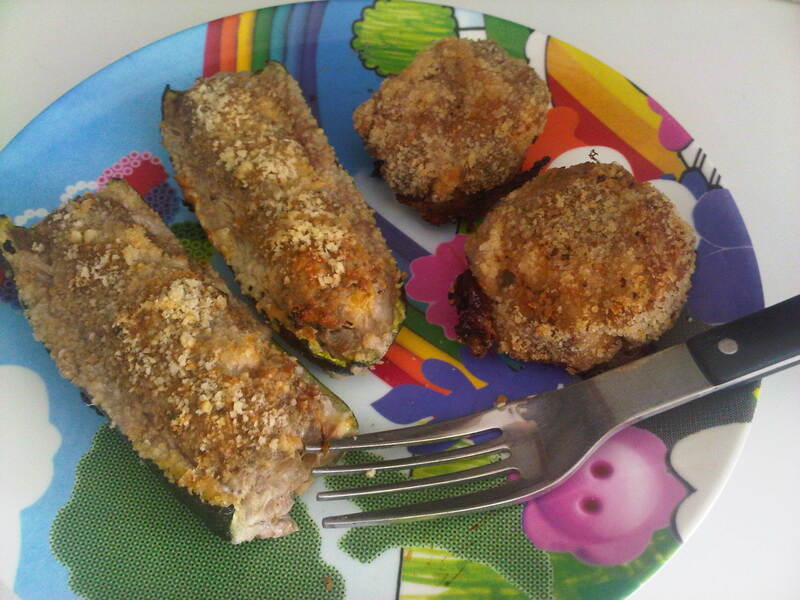 Now you can place the courgettes in the pan and add the latest touch: some other bread crumbs and Parmesan on the top. Put them in the oven at 200 degree for half an hour and the dish is ready! If you prefer them with some tomatoes sauce, you can fry in a pan some onion with oil and when it’s ready you will add some tomatoes sauce and the stuffed courgettes. When the sauce will start to boil, put down the fire and cover the pan until everything is cooked. Enjoy! PS. Mamy siccome dopo Pasqua bisogna stare un po’ attenti, questa settimana ho abolito la pasta e mi dedico solo a delle belle insalate e a piatti di carne e verdure, percio’ mi sono venute in mente le tue zucchine ripiene che buone! Questa volta le ho fatte in bianco, ma puo’ anche essere che domani mi ripasso le restanti con il sugo come le facevi tu.